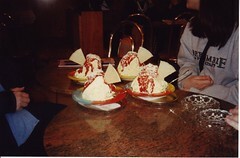 This the ice cream described in that other entry. WISH I HAD SIME RIGHT NOW!!! that's supposed to say "SOME." I get so excited just thinking about spaghetti ice I can't get my fingers to type on the right keys! I totally agree!!! I loved it! Familiar Travel or New Travel? One More Reason Diet Coke is Great!